According to Arsene Wenger, Arsenal tried to sign Leo Messi when he was a 15 year old playing in Barcelona’s youth team. A bold triple deal was proposed for Messi, Fabregas and Pique. Only Fabregas made the move. Arsenal fans may well allow themselves a moment to wonder what would have happened had the boy wonder arrived in North London. Wenger seems to make a habit of announcing signings that he could have made or tried to make. If it’s an attempt to deflect criticism from his dealings in the transfer market then it’s not proving a very successful one. He really hasn’t bought well in recent years and has failed to spend the necessary money to bring in players that would make Arsenal truly competitive at the top of the Premier League and in the latter stages of the Champions League. Signing Alexis Sanchez in the summer signalled some intent but bringing Fabregas back would have sent a much louder message and it would have had more of a galvanising effect on the whole club. Wellbeck has done quite well since his switch from Manchester United (and £16m looks like a reasonable price to have paid) but is he a striker that’s going to fire you to the title? I suspect not. Wenger appears to love a bargain (you can imagine him trying to calculate the true value of the three for two offers in the supermarket) and he also has a preference for signing young players that he can develop. There’s plenty of young talent at Arsenal but as has been pointed out many times in the last few years, the side lacks a bit of experience and leadership. What Wenger would give for a player like Gerrard. The longer a club goes without signing the very best available in the transfer market the harder it becomes. I think that’s a big part of the reason for Manchester United’s summer spending spree. Another season like last season for them and it would have been much more difficult to attract the likes of Di Maria and Falcao. I doubt either of those players would even have considered joining Arsenal. 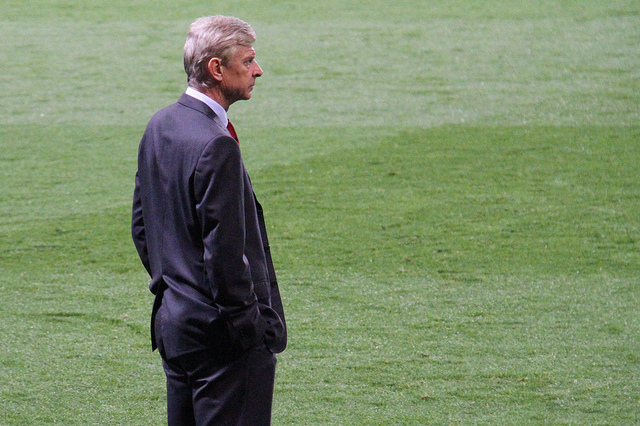 I’m a big fan of the Arsenal boss and there’s much to admire in his footballing philosophy. Messi, I’m sure, would have enjoyed playing under him. The January transfer window is just over a month away. Who would you like to see arrive Arsenal fans? And perhaps more importantly, who do you think is a realistic target for you right now? This entry was tagged Arsenal, Messi, transfer policy, Wenger. Bookmark the permalink.